Written in a mature 12th-century minuscule script in black ink with red rubrics. The fragment is of 22 lines of 1 column, but the original ms. had 2 columns of 30 lines. 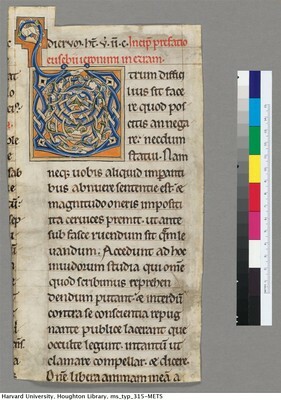 On the recto is a 6-line initial U made up of interlace in blue, green and orange. Probably part of the same ms. as Paris Bibl. nat. de Fr. lat. 8823, to be identified with a 5-volume Bible of the Cistercian abbey of Pontigny.